We had a simply beautiful day to celebrate the Memorial day weekend. The sun rose through clear skies over the ocean as we drove east to the Spring Tide. Heading out of the inlet the seas were less than the forecasted 1-3ft. By the time we reached the dive site they were almost flat. The boat’s mate, Bart, quickly hooked the wreck, and tied us in. Vis on the wreck was 30- 40 feet (depending on who you ask). The storms earlier this week mixed the water enough to bring up the bottom temp close to 50 degrees. The crew did a great job and grappled right into the Wheelhouse, the tallest part of the ship. As we reached a depth of 40ft, the top of the wreck started to come into view, and the clear water made wreck lines unnecessary. There was a slight current from the east, but nothing unmanageable. Schools of cunners, pollock and large tautog encircle the top and side of the superstructure. The top was covered with mussels, and swarms of small fish. Swimming down to the deck at 110 ft, the fish life dropped sharply. Large mussels could be found here with large starfish to match. The hatches are no longer on the holds, which now opened as gaping holes in the deck. My feeble light could not penetrate their dark depths. After swimming along the deck for several hundred feet, it became obvious that the interesting part of the wreck was behind us. Returning to the upper levels of the superstructure, the other divers started appearing on the line. I persuaded a few fish into joining us back on the boat, and headed back to the line. While the water had been mixed up a bit, it was still warmer on the hang. Back on the boat we did our surface interval watching Bart pick through the mussels he brought up, and taking pictures of the 24 inch tog. A few naps were had, and sea stories swapped. The second dive was a bit cooler on the bottom. On the top of the wreck you could see the scintillation of the warm and cold water. Below this line the temp had dropped to 44 degrees. The current was about the same as before. We started our search for lonely fish in search of a friend, circling the decks, peering in the large windows of the bridge passing under the walkways surrounding the decks. Deep in the wreck large tog could be seen staring back at us. They waited patiently for us to leave. There was very little monofilament on this wreck. There were a couple of shot lines on the deck, but not much debris. This would be a great wreck for penetration. The openings were large and clear. The spaces inside looked to be easy to navigate. With proper gear, training and dive buddy, this could be a very interesting wreck. As we returned to the surface the seas had subsided to only a few inches. There was hardly a breath of a breeze over the deck. Bart pulled the hook, and we headed back to shore, another great dive. 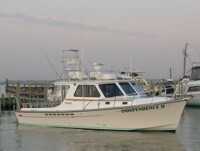 This was the first dive trip of a brand new boat, the Independence II. We met Captains Dan Bartone, and Jay Tempe at the Winter Yacht Basin, Mantoloking, NJ. Having never been there before, we showed up early and watched the sun rise over the bay. The boat slipped in the yacht basin with the quiet hum of restrained power. The 42 foot Evans dive boat was equipped for 100 mile over night trips. She has a top speed of 29kt, and smelled of fresh paint and fiberglass. We loaded our gear and strapped it down. The Dan offered us coffee they were brewing onboard, and someone brought doughnuts. The trip from Mantoloking to the inlet was slow through the back bay, but this gave us time to configure our gear for the dive. We passed the Seeker sitting by the dock just before heading out of the Manasquan inlet. Once clear of the inlet, we cruised out to the Stolt at 20kt. The seas were flat (less than 1 ft), so it felt like we were standing still. The trip only took 30-40 minutes. Jay hooked in and Dan and Mark Clark, jumped in to tie into the wreck. Dave and I helped Corey and Lewis gear up so they could jumped in next. 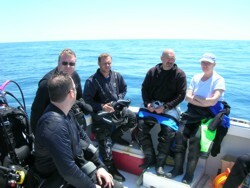 Then we had the deck to our selves as we prepared for the dive. The Stolt Dagali sits in 130 fsw. She was cut in half in an accident, and the stern sank to the bottom. She is laying on here side exposing the upper superstructure, the port hull, and the forward area where she was cut. The Great White Hunter finds his Zen. We had about 40 ft of vis on the wreck. Not bad given the rough seas for the past week. Dan and Mark swam the hook to the top of the port side at 50ft. This made navigation easy, just go to the top of the wreck when your done. Our plan was to do a quick sweep of the sand and see what was there, then sweep back and forth over the superstructure. Dave had not been on this wreck before, so I figured I’d give the guided tour. Once on the sand, we did a quick sweep, and only saw an eelpout and two scallops. We came up to about 100′ and did a sweep of the wreck. There are several large openings where you can see deep into the wreck. If you have the right training, it’s a good wreck for penetration. I was not equipped for this today, and would not consider attempting entry with an unfamiliar dive buddy. We just poked our heads in, and shined the dive lights around. Swimming along we ran into 5 or 6 large entry points. On the outside, I was encourage by the fresh covering of small muscles on the wreck, and the anemones were out and flowing in the soft current. When we hit the aft section, with only the ship’s bottom before us, we turned around and headed forward. At the front, you can see the damage from the collision. You can count the decks as you pass them headed for the keel. Again once at the hull, we turned around and head aft. Each pass we would rise 10 feet or so. On the final pass we were at the anchor line at 50′. After effectively doing a slow ascent the whole dive, we started our short deco stops. Corey and Lewis were just above us on the last few stops. 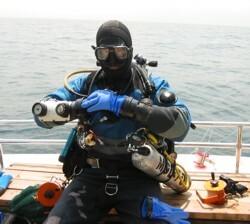 Dave was diving a new drysuit. While he was dry and warm most of the dive, he found that his fins were loose. Given that the current was light, this was not an issue until he got on the ladder. At this time one of his fins fell off and headed quickly for the bottom. When we got on the boat, he dropped a weight overboard tied onto the end of his reel. The hope was that in the light current, the weight would be closed to the fin. Lewis had apparently had a suit flood, and drained two gallons of water out of his dry suit. 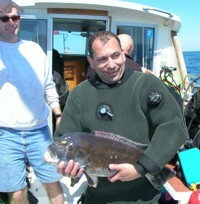 With the 41 degree bottom temp, and the 48 surface temp, he was quite cold by the end of the dive. We sat and talked and sunned ourselves during the surface interval. Lewis was trying to warm up in his dry cloths as his suit was turned inside out hanging from the overhead. Jay had brought is Meg on the trip, and did not want to make a dive due the maintenance requirements. On the second dive, we had a different dive plan. I grabbed my spare reel, and gave Dave my primary. I was going to hold the end of the line while descending the anchor line, tying off at the bottom. Dave borrowed a pair of fins, and would drop down on the line from his reel and look for his lost fin. Once he found it, or gave up trying, he would reel in to get back to the wreck. Meanwhile, I would use my backup reel so he could find me. The plan went off without a hitch. Once I tied off my backup reel, I headed into the sand looking for scallops while I waited for Dave. Dave caught up with me about mid dive. By this time I had made my dent in the scallop population, and was headed back to the wreck. We did a few more passes around the wreck and headed back to the surface. Having spent most of the dive on the bottom, the deco was a bit longer. Dave’s was not as bad, so he headed for the surface. Mine was extended by the choice of gas. My O2 bottle was in for VIP, so deco on 50% took longer. Lewis and Corey were hanging 20ft below. I entertained myself observing their bubbles. I never noticed how the large bubbles reflect an image of what is above them. It’s a perfect mirror. After about 55 minutes in 45 degree water, I was getting a little cold and fortunately time was up. I needed a little help getting on the deck with the catch bag. Lewis had nabbed a few scallops himself, but was shocked to see our haul. We quickly changed into dry cloths and headed back to shore. On the way in the inlet, we saw that the Seeker had been hauled out of the water and was sitting in the dry dock. We unloaded our gear at the dock and headed home. I could not wait to start up the grill.